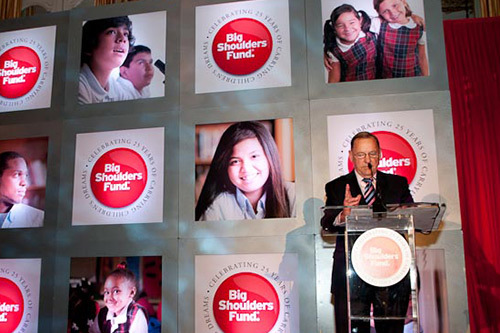 Big Shoulders is a fund that provides financial support to Catholic schools in the neediest areas of Chicago. Since its inception in 1986, the fund has raised more than $200 million. Due to an endowment that covers its overhead, Big Shoulders passes along every dollar of contributed money to those who most need it. After 25 years in business, Big Shoulders faced increasing competition for charitable dollars and needed to re-engage their existing donor base. After initially being hired to produce a short film, TeamWorks scope rapidly expanded to an overall engagement strategy aimed at impacting and motivating Big Shoulders most prominent donors to increase their commitments. The Big Shoulders 25th Anniversary Gala raised more than $6 million, making it one of the most successful fundraising events in Chicago history.